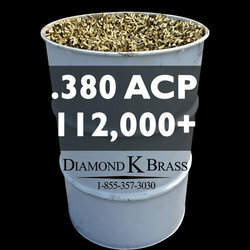 .380 Auto fired brass, Mixed Head-Stamps, 55 Gallon Drum of approximately 112,000 casings. *NOTE* SALE PRICE DETERMINES SUBTOTAL PRIOR TO SHIPPING COSTS. THE BUYER IS RESPONSIBLE FOR ARRANGING AND PAYMENT OF FREIGHT FOR SHIPMENT.